Washington senior Tabby Woods puts up a shot during a non-conference game against the Braves of Shawnee High School at Washington Thursday, Jan. 24, 2019. Pictured for Shawnee is senior Paree Furness. 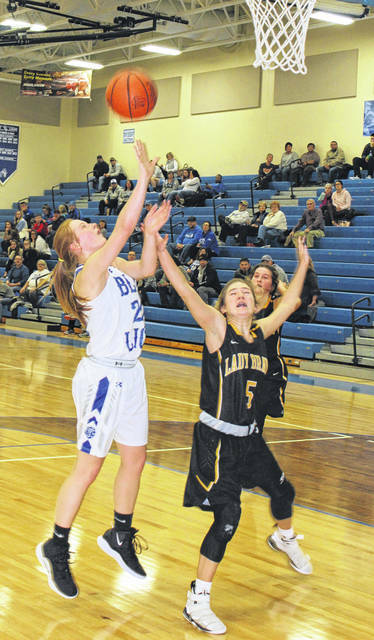 The Washington Lady Blue Lions returned to the court Thursday for a non-conference game against the Braves of Shawnee High School. It may have taken them a little while to get going, but once they did, Washington rolled to a 48-21 victory. The Lady Lions are now 12-4 on the season. Senior Hannah Haithcock outscored the entire Braves team with 23 points. She also led her team in rebounds with nine. Juniors Rayana Burns and Shawna Conger each added nine points for Washington. Burns led the Lady Lions in three categories: assists, 5; steals, 6 and blocked shots, 2. She also had six rebounds. Burns is averaging at least two blocked shots a game over the last 10 games, according to Washington head coach Samantha Leach. A trio of players — seniors Josie Gray and Paree Furness and junior Andi Meeks — scored five points each for Shawnee. Washington held a 10-8 lead at the end of the first quarter. The Lady Lions led 20-10 at halftime. If the visitors had any hopes of coming back in the game, those hopes were dashed in the third quarter as Washington scored 21 to the Braves’ seven. The Lady Lions subbed in all available players in the fourth quarter en route to the 48-21 victory. “We were a little out of our rhythm at the start,” Leach said. “We’ve been off for a week and we’ve had two games postponed because of the weather. I felt like it took us a while to get going. “The girls turned it around in the second half,” Leach said. “Especially the third quarter. We played with more intensity. We played a lot better defensively this evening. I thought the girls did a good job on the boards. We only gave up two offensive rebounds to them. Washington is at Minford Saturday. The Lady Lions are having a ‘Pink Out’ game at home Wednesday against the McClain Lady Tigers. On Saturday, Feb. 2, Washington will be inviting former players back to be honored at halftime of the game against Grove City. The above three games all have a j-v start time of 5:30 p.m.
WASHINGTON — Rayana Burns 4-1-9; Bre Taylor 0-0-0; Kassidy Hines 1-0-2; Tabby Woods 0 (1)-0-3; Shawna Conger 2 (1)-2-9; Maddy Jenkins 0-0-0; Hannah Haithcock 11-1-23; Abby Tackage 0-0-0; Aaralyne Estep 0-0-0; Haven McGraw 1-0-2. TOTALS — 19 (2)-4-48. Free throw shooting: 4 of 10 for 40 percent. Three-point field goals: Woods, Conger. Field goal shooting: 21 of 48 for 44 percent. Turnovers: 11. SHAWNEE — Aaliyah Hassan 0-0-0; Deanna Barnes 0-3-3; Paree Furness 1-3-5; Hannah Spitzer 0-1-1; Hannah Beers 0-0-0; Mary Lyons 0-0-0; Tori Malicki 1-1-3; Andi Meeks 1 (1)-0-5; Isabella DeMayo 0-0-0; Zoe Ballard 0-0-0; Josie Gray 2-1-5. TOTALS — 5 (1)-9-21. Free throw shooting: 9 of 14 for 64 percent. Three-point field goal: Meeks. Field goal shooting: 6 of 24 for 25 percent. Turnovers: 18.
https://www.recordherald.com/wp-content/uploads/sites/27/2019/01/web1_Tabby-Woods-vs-Springfield-Shawnee-1-24-2019.jpgWashington senior Tabby Woods puts up a shot during a non-conference game against the Braves of Shawnee High School at Washington Thursday, Jan. 24, 2019. Pictured for Shawnee is senior Paree Furness.